You’ve probably been asked (or asked yourself) this question before: Where should I eat right now? Luckily, the editors here at Blue Lifestyle have got you covered. NYC dining enthusiasts want to know what’s new, what’s hot, and what’s coming next in delicious urban fare, so we’ve compiled a list of the 5 most popular restaurants to eat at in the city this October. Since leaving Harlem’s famous the Cecil and Minton’s last year, James Beard-nominated chef JJ Johnson has taken over Henry at the Life Hotel in Midtown, marking the first time the esteemed chef will be back in a full-service kitchen. This time Johnson features an exciting menu rooted in an amalgamation of flavors from across Africa, the Caribbean, and the American South. 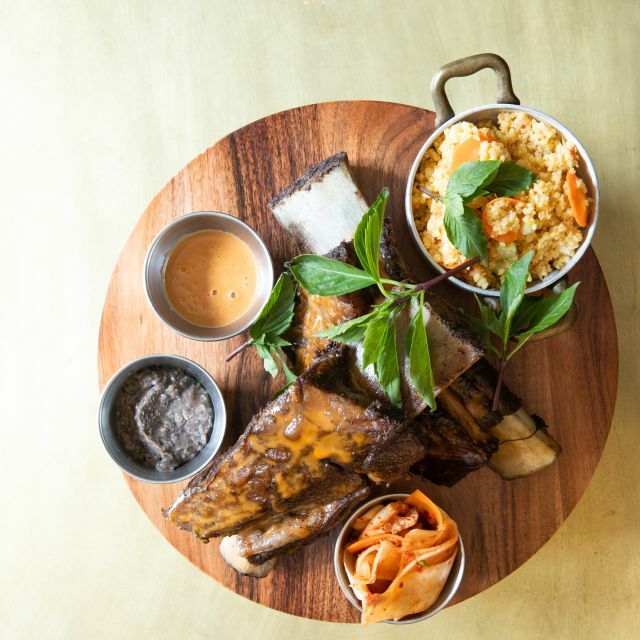 A short rib with millet, hoisin barbecue sauce, and black beans is one of the dishes that is piquing everyone’s interest, and so is Johnson’s collard green salad and shrimp and pork dumplings with Portuguese sausage. Former Seamstress bartender and cocktail virtuoso Pam Wiznitzer, who’s in charge of Henry’s drinks, is also drawing flavors from the cuisine of the African Diaspora for her cocktail menu. If you’re not in the mood for a 10-course, $175 tasting menu in a rather austere, grey atmosphere, then you might want to try Atomix’s well-loved firstborn, Atoboy, in the NoMad area of Manhattan. At Atomix, chefs Ellia and Junghyun Park, the former Chef de Cuisine of Jungsik, a two Michelin starred Korean restaurant in New York, specialize in seafood fare such as a soup with burdock, fish cakes, plum blossom, and baby corn. The bar also features innovative Korean flavors rooted in modern and traditional techniques that won’t leave you disappointed. If the rage-inducing news cycle has gotten anyone else feeling down this week, Sans (cleverly named after the French word for “without”) has the fix for you. The EMP and Nomad alum Champ Jones is serving upscale vegan comfort food in the Carroll Gardens neighborhood of Brooklyn, featuring elevated classics like a “TV dinner” complete with a mushroom-stuffing meatloaf and sides of carrots, peas, and pomme puree, as well as a “Lasagnette” with béchamel and savory foam. The intention behind Sans is simple—“plant-based indulgence”—and, really, it seems perfectly fit for our times. Popular Druze restaurant Gazala’s returns to the Upper West Side, celebrating chef-owner Gazala Halabi’s rich culinary heritage as an Israeli Druze, a religious minority in the state of Israel. The Druze are known throughout the Middle East for their hospitality and tradition of respect for guests, not to mention their wonderful cooking ability. There’s already a small location in Hell’s Kitchen, but this new, 100-seat outfit offers a longer menu and tasty alcoholic beverages with arak, an anise liquor popular throughout Israel and Palestine. Beyond Halabi’s delicious, springy pita and marinated kebabs, you’ll find fantastic shawarma, cauliflower tahini salad, and even shrimp hummus. Reborn in the Lower East Side with a much larger space, Kopitiam is a fast-casual eatery home to Nyonya cuisine, a hybrid of Chinese and Malay flavors drawing ingredients and techniques from both cultures with influences from the Portuguese, Dutch, and the British. Head chef and founder Kyo Pang, a third-generation Baba Nyonya, and restaurateur Moonlynn Tsai feature Malaysian-style boiled egg and thick-cut sweet toasts for breakfast and dishes such as grilled fish cake and spicy stir-fried duck tongue for lunch and dinner. Black coffee with ghee and Penang-style white coffee are also on order, as well as a delicious coconut crepe that people can’t stop talking about. Just don’t go on Wednesday’s—because they’re closed.